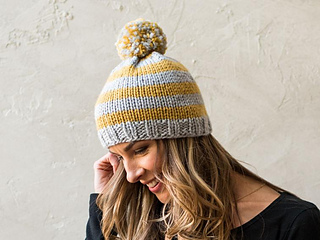 Who doesn’t love a stripey beanie with a pom-pom on top? This simple and quick hat starts at the brim with a rib stitch. The body of the hat stripes two colors every four rounds while the yarn is carried up on the inside. The top of the hat is finished off with two quick decrease rounds. A colorful pom-pom tops things off!